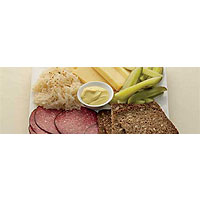 Arrange 12 slices of German pepper salami in the corner of a large platter. Add 4 gherkins, quartered lengthwise, and a small mound of sauerkraut topped with a sprinkling of toasted mustard seeds. Decant your favourite mustard into a little pot in the centre of the tray. Complete the spread with a stack of organic rye bread with sunflower seeds and some hunks of nutty cheese. Although it's made in neighbouring Switzerland, Gruyère works really well with this otherwise German selection.